In some cases, you may want to apply a specific rule or edit to group of products that can be grouped in a specific way. For example, changing your price for a specific brand. Or making sure that a specific brand isn't listed to a channel. Zentail has the tools to run this on a time time basis as a bulk action, or as a business rule. There are also some preexisting bulk actions too. Important: this is an extremely powerful feature that creates bulk changes in to catalog. Make sure you're comfortable with filters and understand the expected results of a bulk action before running one. There are a few steps to creating a bulk action. Here's a quick video walkthrough. 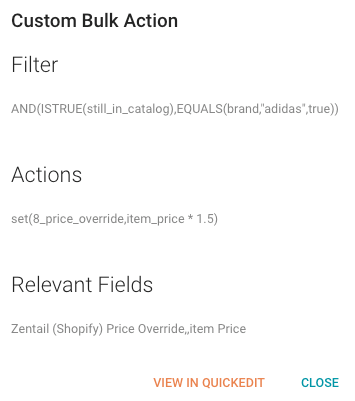 In this example, we'll create a bulk action to change Adidas pricing on our Shopify store to be 4% more than our item price. To add an action, you can use the teal plus button at the bottom of the screen. That will open up a window where you can select the the attribute you want to set, and the value you want to set it to. This equation can include references to current fields. 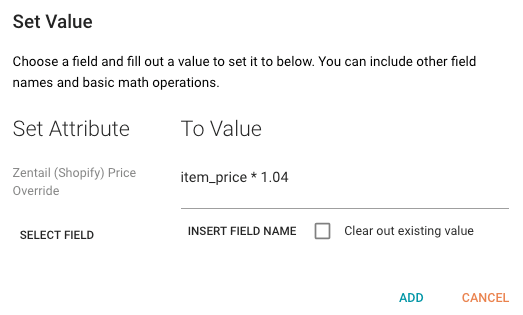 The "Select Field" and "Insert Field Name" buttons are helpful to search for the attributes you want to set and build your equations off of. Currently, these equations can set a text field to a string value, such as "Large Red Shirt", or perform basic math functions like addition, subtraction, multiplication, and division. Entering a number outside of an equation, or true/false will require quotes. Note: to make a value blank, leave the "To Value" blank and simply check off the "Clear out existing value" box. Some bulk actions are already built into Zentail. Please consult your onboarding specialist before running any of these bulk actions. You can use the run history to see the progress of a bulk action, or see a description of the action and affected fields. These links can also take you directly to a quick edit view where you can see the results.